FPQM audits across beer category in Major Multiples, Independent and Wholesale outlets. Assess the on-shelf pack damage to outer packaging for our client’s multipack skus versus other brands across Asda, Tesco, Independent and Wholesale outlets. Our field team visited each store and assessed the outer packing for each of our client’s skus against a list of defects which was provided by the client. 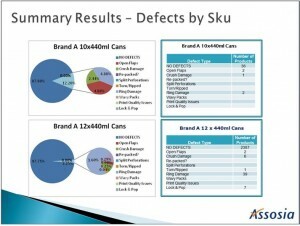 Competitor brands were recorded as a total figure for all packs, however, where defects were found, the actual sku was recorded. 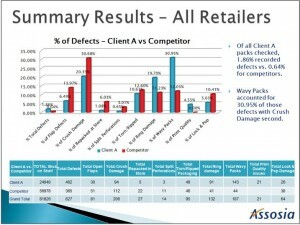 Of all our client multipack skus checked, 1.86% recorded defects vs. 0.64% for competitors. 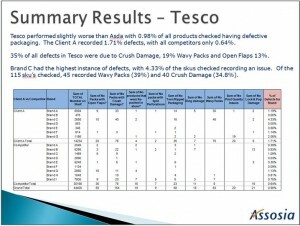 Wavy packs accounted for 30.95% of those defects with the crush damage coming second. 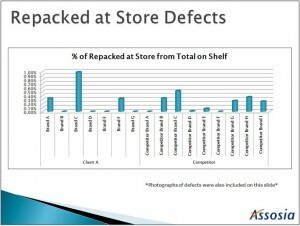 Our data allowed for our client to focus on the defects founds and to determine where the issue was coming from, whether it was at a manufacturing level, damaged in transport and storage conditions at store level. Results were delivered to our client in excel format with pre-defined pivot tables, along with a full summary presentation. All reports and photographs were uploaded to our clients dedicated DMS (Document Management Server) for easy, but secure access.